The Charlotte Lozier Institute’s Vice President and Director of Research, Dr. David A. Prentice, has recently been named chairman of the advisory board for the Midwest Stem Cell Therapy Center (MSCTC), a leading hub of stem cell treatment, research, and education in Kansas and the surrounding region. The MSCTC was created by Governor Sam Brownback and the Kansas Legislature in 2013, a process in which Dr. Prentice himself was instrumental. As the new field of adult stem cell therapy emerged, the rapid success in clinic trials and the need to connect new treatments to suffering patients, led to the idea of creating a center in the state of Kansas which would facilitate this process, as well as engage in new avenues of research and in the education of physicians and patients on adult stem cell therapeutic options. In less than five years, the center has brought Kansas to the forefront of the nation’s research and therapy using adult stem cells. Located on the University of Kansas Medical Center campus, MSCTC’s FDA-registered GMP facility (an adult stem cell “factory”) is the only such facility in the region and on par with the best in the U.S., providing ethically sourced clinical grade stem cells for laboratory research, clinical trials, and patient therapies. The center’s staff are engaged in cutting edge research to bring more adult stem cells from the laboratory into the clinic. A world-renowned expert in adult stem cells himself, Dr. Prentice is also a native Kansan who earned his Ph.D. in biochemistry from the University of Kansas. 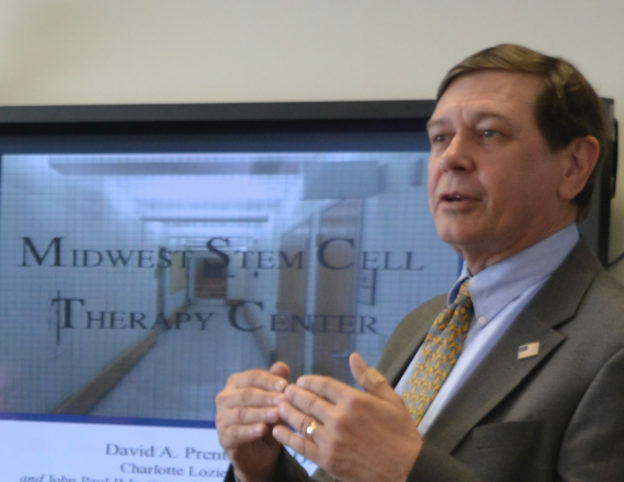 Having engaged in stem cell research, lectured on the subject for decades, and then devoted his career to educating policy makers, medical and scientific professionals, and the public about adult stem cells, Dr. Prentice encapsulates the comprehensive nature of the MSCTC. Dr. Prentice also embodies the center’s unique patient-centered focus, as seen in the establishment of Stem Cell Research Facts, an educational website providing scientific facts and patient-centered videos about adult stem cells. The future is bright for adult stem cell treatment options and for the MSCTC. Well over 1.5 million patients have already benefited from adult stem cells globally and the horizon broadens with each discovery, each smiling patient. MSCTC is making great strides along this path, and CLI is honored to have Dr. Prentice assisting in the noble work of MSCTC as advisory board chairman.